Sealaska Heritage Institute (SHI) will sponsor a free lecture next week on voyages of the Tlingit, Haida and Hawaiians across the Pacific in ancient times and the origins of the Polynesians. 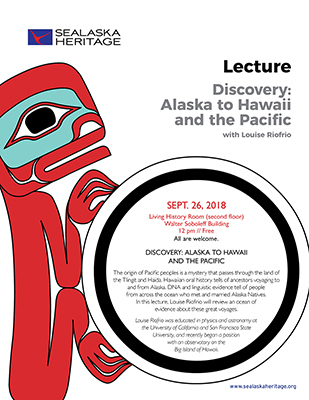 The lecture, Discovery: Alaska to Hawaii and the Pacific by author and scientist Louise Riofrio, will be based on her book of the same name. In her talk, she will explore evidence that suggests Alaska Natives traveled to Hawaii and delve into the question of whether Northwest Natives were the first Polynesians. “The origin of Pacific peoples is a mystery that passes through the land of the Tlingit and Haida. Hawaiian oral history tells of ancestors voyaging to and from Alaska. DNA and linguistic evidence tell of people from across the ocean who met and married with Native Alaskans. We will review an ocean of evidence about the great voyages of Native Alaskans,” Riofrio wrote. Riofrio was educated in physics and astronomy at University of California and San Francisco State University. She worked as a scientist at NASA Johnson Space Center in Houston, performing experiments with lunar samples. Since 2017 she has worked on Mount Roberts with the Juneau Raptor Center caring for rescued bald eagles. She recently began a position with an observatory on the Big Island of Hawaii. She is also the author of the popular book The Speed of Light. The free lecture is scheduled at noon on Wednesday, Sept. 26, at the Walter Soboleff Building in Juneau. Everyone is welcome. Sealaska Heritage Institute is a private nonprofit founded in 1980 to perpetuate and enhance Tlingit, Haida and Tsimshian cultures of Southeast Alaska. Its goal is to promote cultural diversity and cross-cultural understanding through public services and events. SHI also conducts social scientific and public policy research that promotes Alaska Native arts, cultures, history and education statewide. The institute is governed by a Board of Trustees and guided by a Council of Traditional Scholars, a Native Artist Committee and a Southeast Regional Language Committee.